Hello! A new species of Mexigonus from Oaxaca poses for the camera. 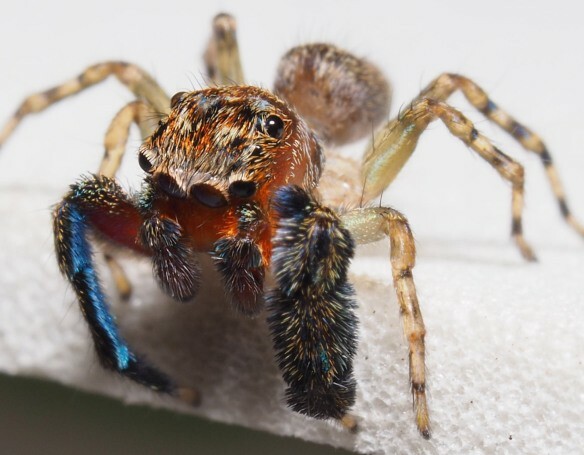 Last year, University of British Columbia zoologist Wayne Maddison travelled to the highlands of southern Mexico in pursuit of undiscovered species of jumping spiders. He kept a journal of his adventures, documenting his encounters with resplendently beautiful arachnids. Below is a short excerpt from his journal. You can read the full report of the expedition on Maddison’s website. It’s been more than three years since I’ve been on a major field expedition. Today I fly to Mexico to begin three weeks in the mountains of Oaxaca and Chiapas with fellow salticidologists (jumping spider experts)! We will be looking for new species of jumping spiders, with special focus on Mexigonus, a genus with only a few known species. 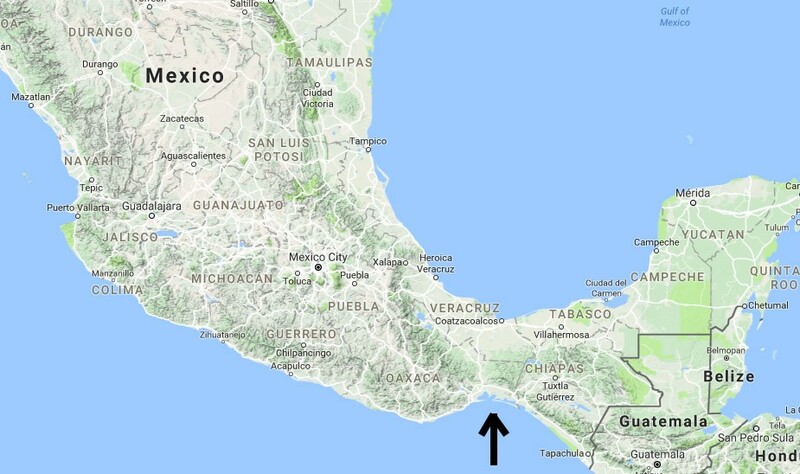 Isthmus of Tehuantepec, shown with arrow (map from Google Maps), where spider experts looked for new eight-legged friends. 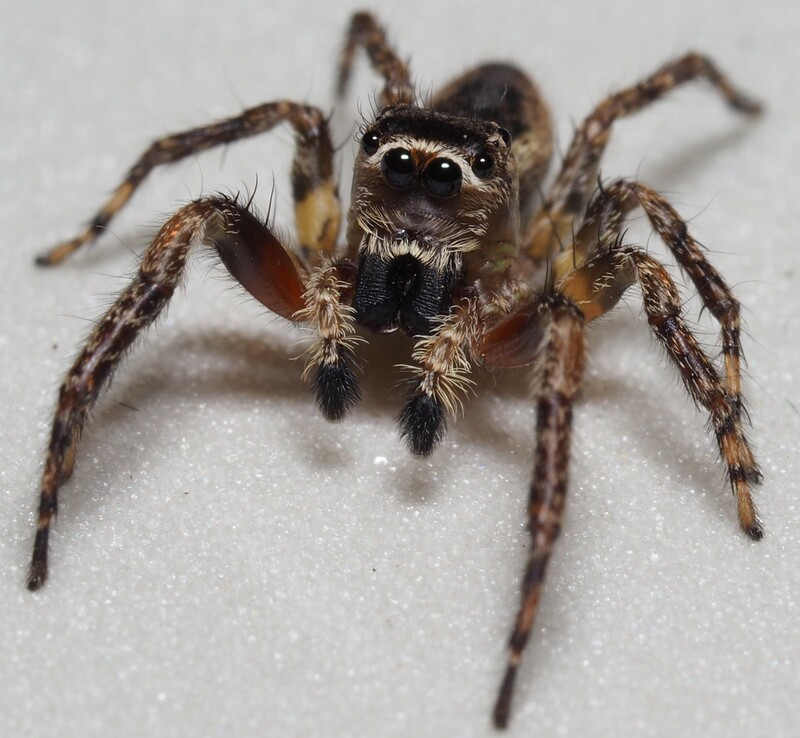 There are many poorly studied groups of spiders, so why did we choose to focus on Mexigonus? Because of the mountain ranges that fragment the Mexican highlands into isolated patches of habitats, Mexigonus spiders diversified into many unique species. Studying the diversity of Mexigonus species and their evolutionary relationships could help us understand the biological history of this region. 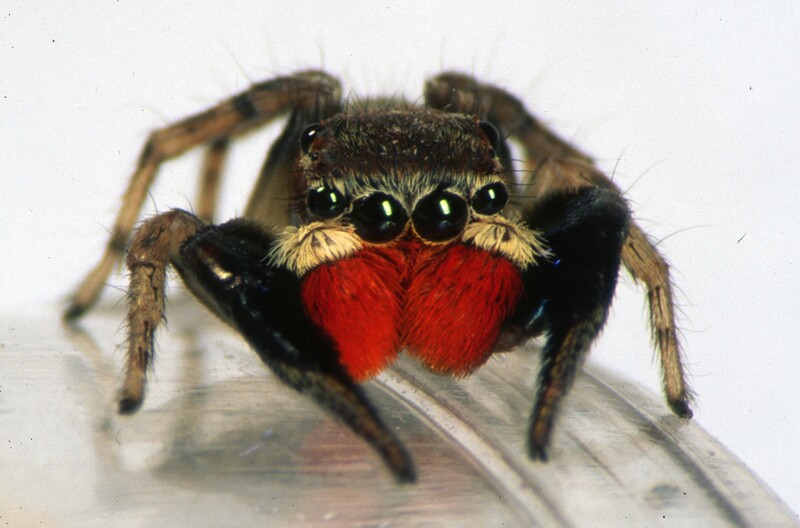 Another attraction of Mexigonus is the red courtship ornamentation that males of some species have — attractive to female spiders perhaps, but to us scientists, attractive because red ornamentation is not common in jumping spiders. 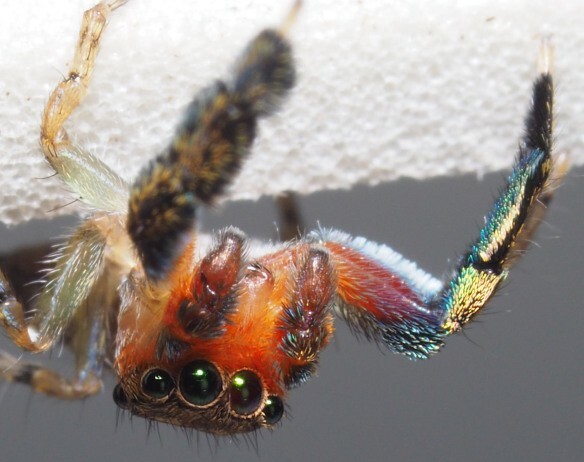 There’s a good chance that most jumping spiders can’t distinguish red (they are colour blind, in a sense), and so when we find a spider that can, it could tell us something about the evolution of colour vision. Learn how Dr. Maddison and other salticidologists (jumping spider scientists) hunt for new spider species. For our first full day of collecting, we are guided south of Ixtlán, to the community of Lachatao. The winding mountain road brought us to a pine-oak forest that looks a lot like Canada, until you see the bromeliads — the family of flowering plants pineapples belong to — decorating the trees. It wasn’t quite wet enough to be a cloud forest, but it had some of the elements — not only the bromeliads, but also many other epiphytes (plants growing on other plants) on the branches of the oaks, especially lichens and mosses. I brought to this collecting expedition a particular concept of where Mexigonus jumping spiders live: mostly on dry fallen leaves beneath trees. I had formed this idea from previous collecting of other jumping spiders. As I’d collect Habronattus — one of my favourite groups — on such leaf litter, I’d often find a few Mexigonus along the way. Given this preconception, when we got to the Lachatao forest, I started looking on the leaf litter, and promptly found a little humble brown and tan Mexigonus species quite common there. Good! I decided to try something bold, to look on leaf litter not on the ground, but accumulated in the crooks of branches of the trees. I found a strange cryptically-coloured Mexigonus and was motivated to keep looking above ground. The team found this cryptic Mexigonus to be common on the epiphyte-covered branches of the oaks — not the habitat of my preconceptions. We call this species “triste” (sad) for the melancholy expression on their little faces. Here is a male. Mexigonus “triste,” male. In the end we found two species of Mexigonus on the ground, as I’d expected, but three species in bushes and trees (we called them sad face, black pepper, and purple tomato). All five of the species are most likely new to science. We’d been collecting in the El Triunfo cloud forest for an hour or two when we arrived at the crest of the trail, 2,100 metres above sea level. Up to that point, we had been finding only a single species of Mexigonus, a brown and creamy-yellow one. Then we several found dark brown Mexigonus females that looked unfamiliar. We wondered: what do the males look like? Male and females of many spider species look quite different. 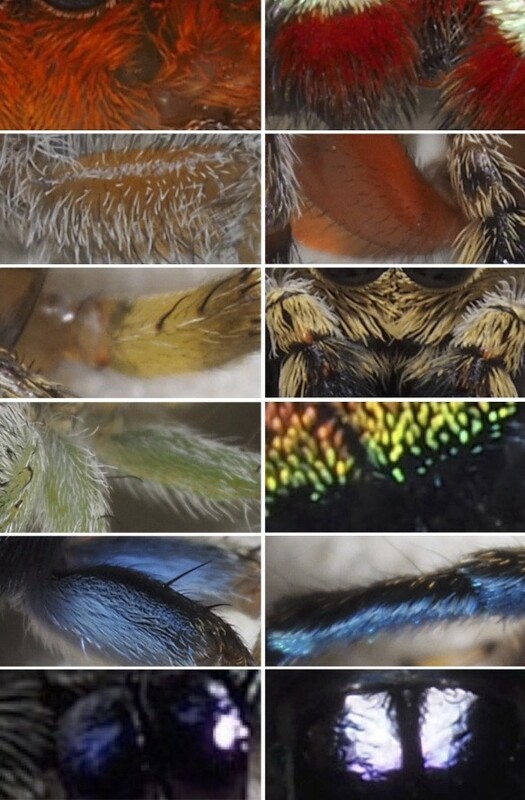 Male jumping spiders often bear fancy plumes and colours they show during dances to the females. And, of course, their genitalia are different. Because we taxonomists find many useful characters to distinguish species in their genitalia, we want to find both male and female specimens of each species in order to describe the species completely. Brown and creamy-yellow Mexigonus from El Triunfo, nice but not too exciting. But, I have to admit, spider scientists tend to be biased toward the males. The males are easier to distinguish and are sometimes spectacularly ornamented. Seeing those two dark females was like hearing the call of an unfamiliar bird but not seeing it. We knew there was a kind of male in this forest, perhaps right in front of us, that we had never seen before. Would the males have muted colours, or would they burst resplendently from the forest like a colourful quetzal? Knowing there were males out there, we tried to guess their precise habitat. The females had been on small trees with some mosses and suspended dead leaves, and so we tried shaking various such trees over our sheets, seeing what fell out. After about an hour, we had found some juveniles, but not adult males. We were discouraged. One of his most noticeable features is the wide fringe on the sides of his first legs, like the bell-bottomed spiders from Oaxaca. These fringes make his first legs appear very wide from above, but very narrow from the side. Mexigonus “quetzal” male. Notice the blue glow from his right legs! Under some lights, the face positively glows orange-red. Generally he hides his colours, but put him in front of a female and this is the courtship pose he took. Arthur C. Clarke once wrote “Any sufficiently advanced technology is indistinguishable from magic.” There is an implicit shift of observer here, from those who make the technology (to whom it isn’t magic) to those who see the technology for the first time (to whom it looks exactly like magic). As an evolutionary biologist, I would suggest a generalization of this: “Any sufficiently advanced creative process generates products that are indistinguishable from magic.” Natural selection is one such creative process, and its products often seem as magic before we get a chance to study them. A rainbow of colours, courtesy of Mexigonus. Please share this story with your friends and hit the applause button. Follow UBC Science on Twitter, Facebook and subscribe to our newsletter.